click here to learn more about Sentry's Solar Friendly options. The receiver provided with the Sentry gate opener operates at 433 MHZ and might or might not be compatible with your garage door. If receiver frequency is not compatible the optional “Sentry Garage Door Receiver kit” can be easily installed in the garage. 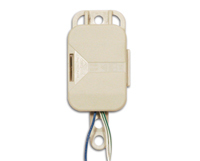 The kit contains receiver, transformer and a wire harness that easily installs to the existing garage door. One receiver will be needed for each garage door. All existing transmitters used for garage door will continue to operate. They are not being disconnected. Mounting hardware included. To program open receiver box cover. Place small screw driver in slot to open. Press the learn button. Then press the transmitter button that will be used to open the garage. See garage opener for connecting the 2 wires supplied. © 2019 USAutomatic, LLC All Rights Reserved.